Dear customer, thanks for filling out our form! We shall be contacting you soon. Who is the ideal customer for CRM ONE? 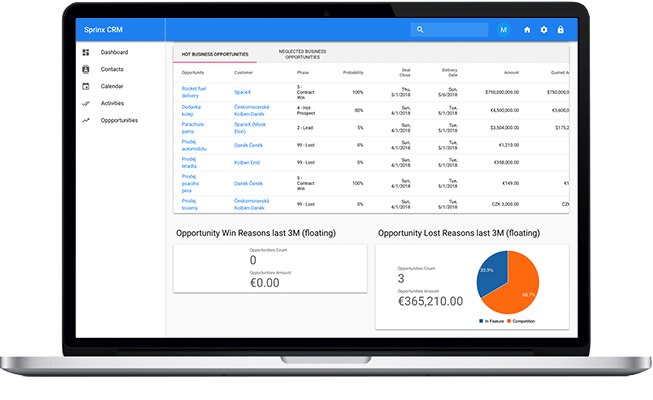 CRM ONE is ideal for a small to medium size company, typically 1-20 users, who need access to their data in the field on their mobile device. Is there customer support if I have a question or need technical assistance? YES. Customer support is extremely important to us and one of our Customer Support Specialists will be very happy to help you with any question and solve any technical issue ASAP. Can I try CRM ONE for free to see if it is a good fit for me? Absolutely. CRM ONE Free Trial includes all the features from the Optimum Package including customer/technical support, integration with Microsoft Exchange, Yahoo, Gmail, Mail Chimp and Quick Books. Is CRM ONE right for me? CRM ONE might be right for you if, you are currently using a CRM and would consider a BETTER AND SIMPLER solution. Sprinx Systems LLC. © 2017. All Rights Reserved.